Photo © 2017 TriStar Pictures. Who can resist a pig and a chicken?!! But the set was accurately detailed, of course! Did we mention that this was a very bad choice for the next heist? Baby [Ansel Elgort] on the run, not driving! This has been home for Baby ever since his mother died when he was young. Baby’s love of music is fueled here. 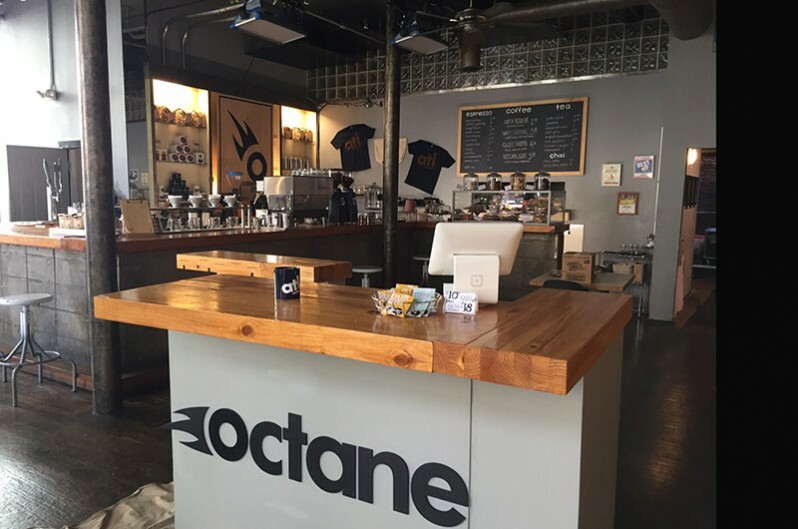 But of course there was no Octane coffee bar in the locations where they were filming, so Totten worked closely with the owner to replicate one! The runaway hit film about an innocent-looking getaway driver who gets hardened criminals from point A to point B with daredevil flair and a personal soundtrack running through his head! 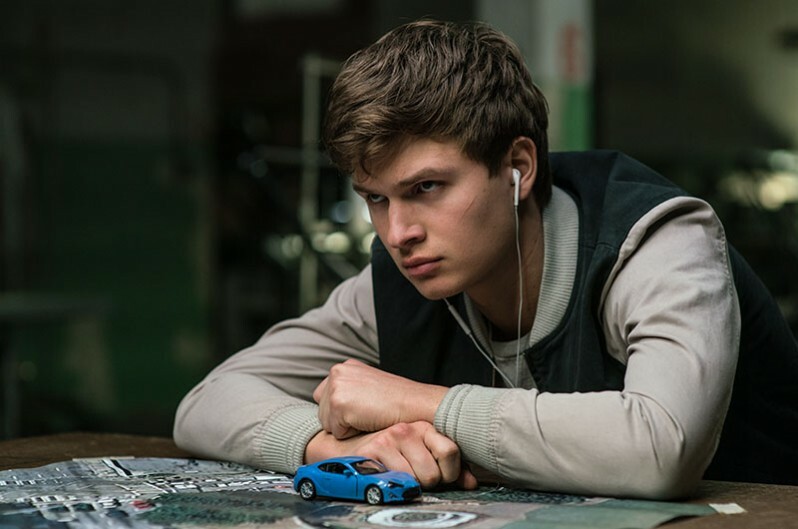 Baby (Ansel Elgort) has his escape route plotted to the beat of specific tunes that go from his well-curated iPod straight to his ears, and which translate into expertly timed hairpin turns, gear shifts and evasive maneuvers that leave his passengers on the ride of their lives. 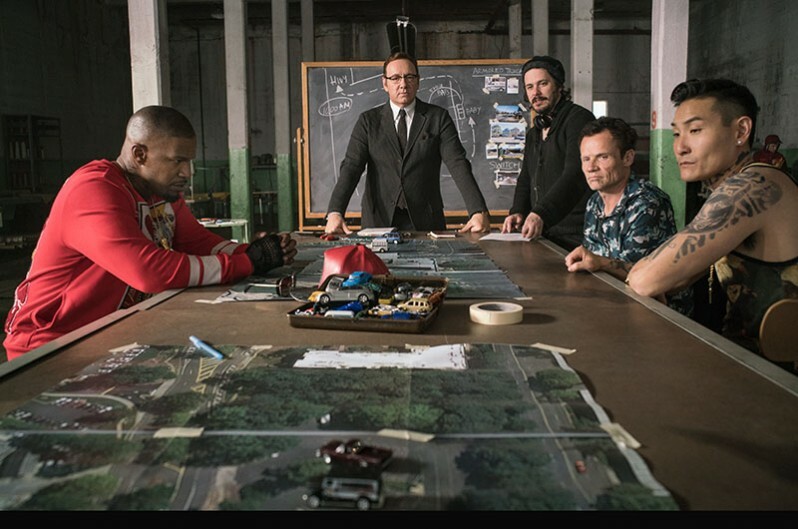 Which makes BABY DRIVER, with its mixture of mph and music, the newest explosion of genre-crossing excitement from Writer-Director Edgar Wright, an action thriller unlike any other. SET DECOR: Our readers love the feel of being behind the scenes with you, so please take us on that ride! Was this an inclusive working relationship, a true collaboration with the writer/director/savant? 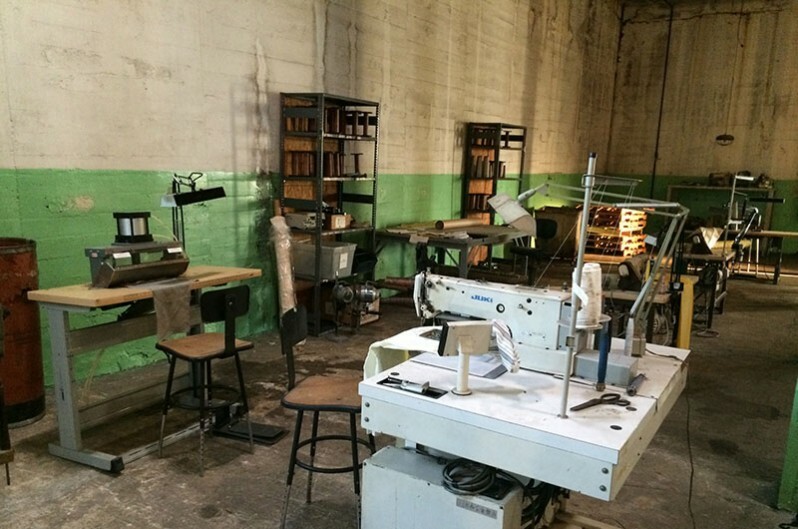 Set Decorator Lance Totten SDSA: Our working relationship was great. Though he's surrounded by a very loyal and familiar inner circle, they were all excited to be in Atlanta and working with some of our best crew. I found him (and them) friendly and eager to collaborate. That being said, Edgar knows exactly what he wants, so there's not a lot of need to try and convince him of anything! 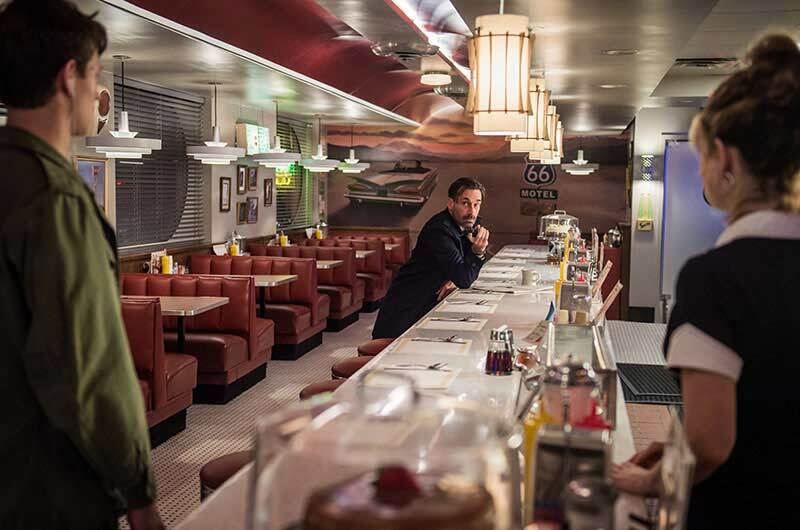 The diner is obviously a huge visual element of the film. It’s a location that initially signifies peace and calm for Baby, mired in this American iconography of cars and highways and music as it is. Later in the film, after dark, it takes on a much more sinister vibe and actually becomes a place of menace and violence. I’m fortunate in that I have great relationships with some vendors in Atlanta that are crucial for getting the right kind of period dressing for a set like this. 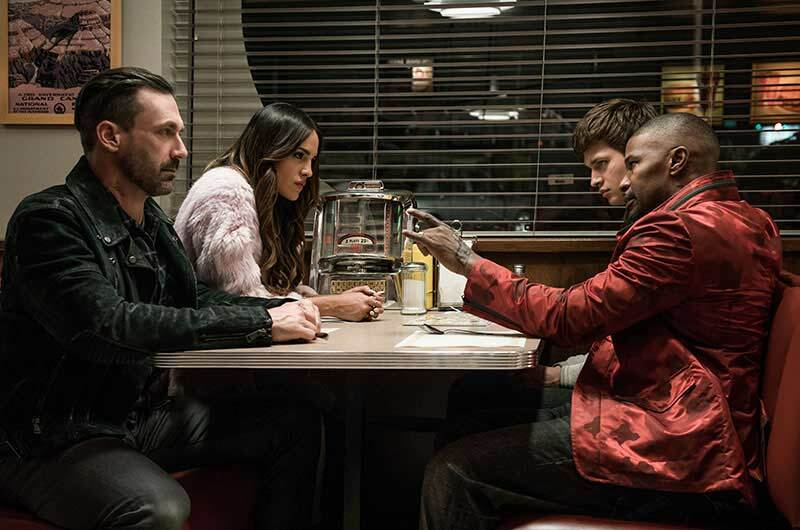 I’ve done a lot of diners on other projects in the past, and although BABY DRIVER is a contemporary piece, there are a lot of period elements throughout the sets. I think some of that just came instinctively from understanding director Edgar Wright’s influences and references for the film. 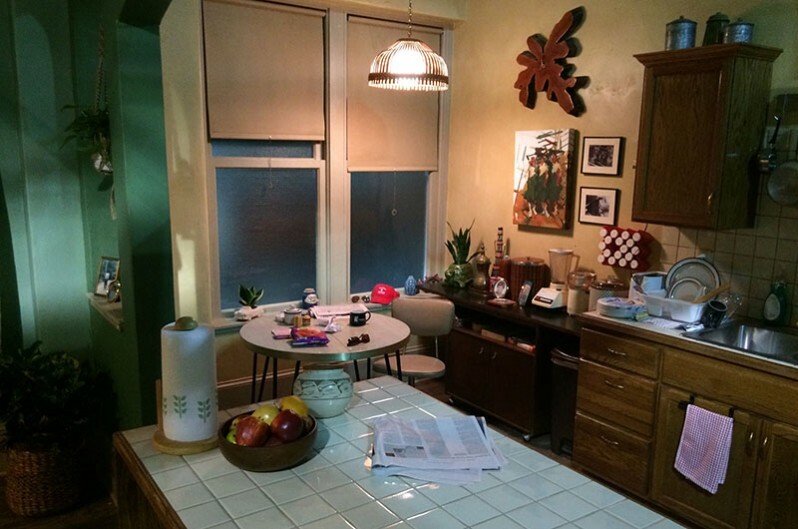 But it was initially confusing when I’d talk to my buyers and vendors because it wasn’t like it was set in 1965 and had to be specifically period accurate. I did try to ground it in some sense of reality with a backstory like the place was owned by a local family and had been in business for decades. We had quite a bit of creative license, but I didn’t want it to look cartoonish like a “theme” diner made for a mall or something. 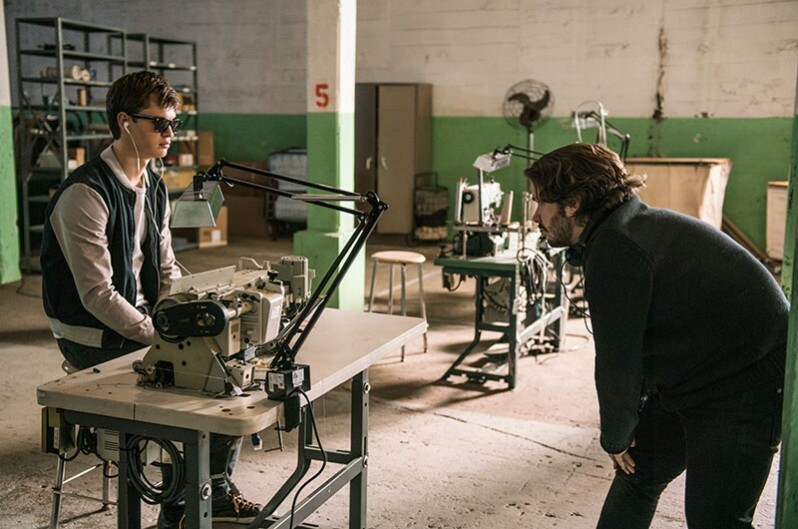 A big challenge for me throughout the film was finding a balance between the kind of realistic, research-based decorating I’m accustomed to and the hyper-stylized feel Edgar Wright was going for. Production Designer Marcus Rowland was the perfect conduit for that, as he’s done all of Edgar’s movies and understands his style better than anyone. There were occasions where I’d think, “Well, no one in Atlanta would do that...” or “That’s not something you’d ever see in this country!” ...and then realize that ultimately what we were making was a movie about America through the eyes of a foreign movie buff, and that it was much more a film about American movies and popular culture than anything else. So I tried to bring the correct things into the mix for the characters and the setting of the story, and then let Marcus augment them in a way that was right for Edgar’s aesthetic. Marcus had a lot of wonderfully non-linear visual concepts that I probably would not have thought of as they were beyond the usual narrative scope. But they just worked. In that sense, it took me back to when I used to work on commercials and music videos where visual cues can sort of exist for their own sake. All in all, I think it came off very well. I couldn’t be happier with the finished look of the sets. And everyone was so nice! Doc’s Loft came together rather quickly. 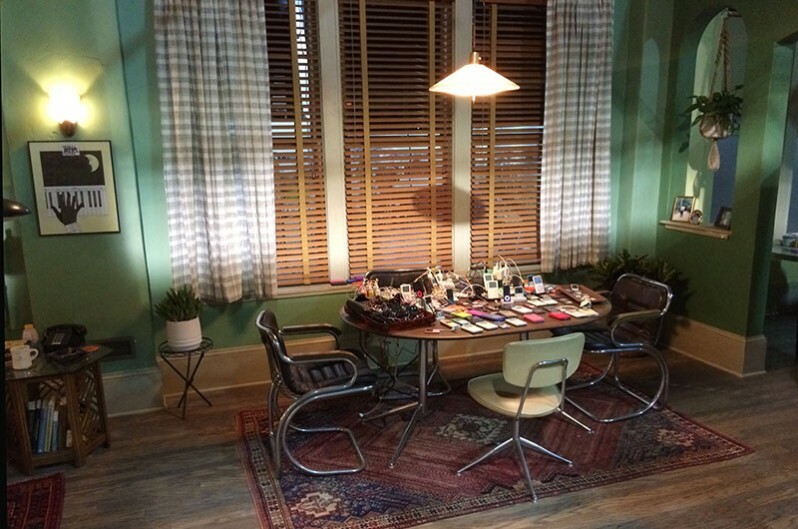 Initially it was scripted as “Undecorated Loft” and later “Abandoned Loft” and was meant to be rather empty. 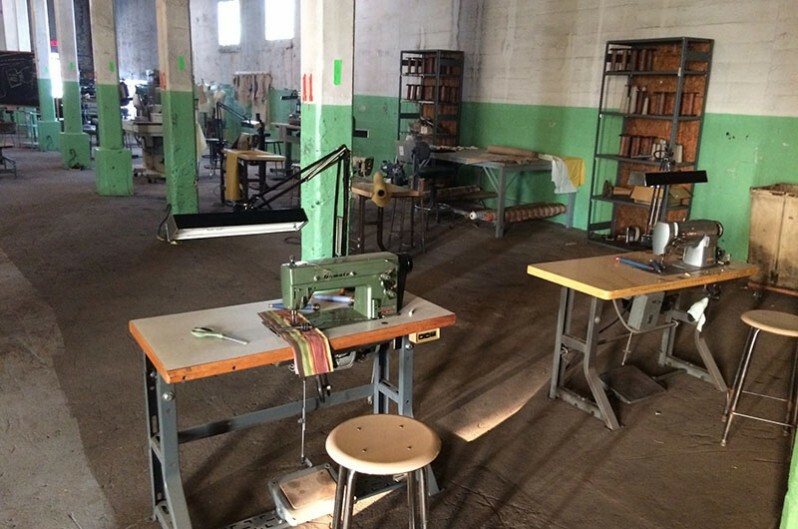 One of the very first things I did before my buyers even started was go out and find old industrial sewing tables to rent for the space. From there, the look of the Loft just kind of evolved through research and one or two conversations with Marcus. Mannequins and suit-forms and other items of haberdashery came along a bit later. 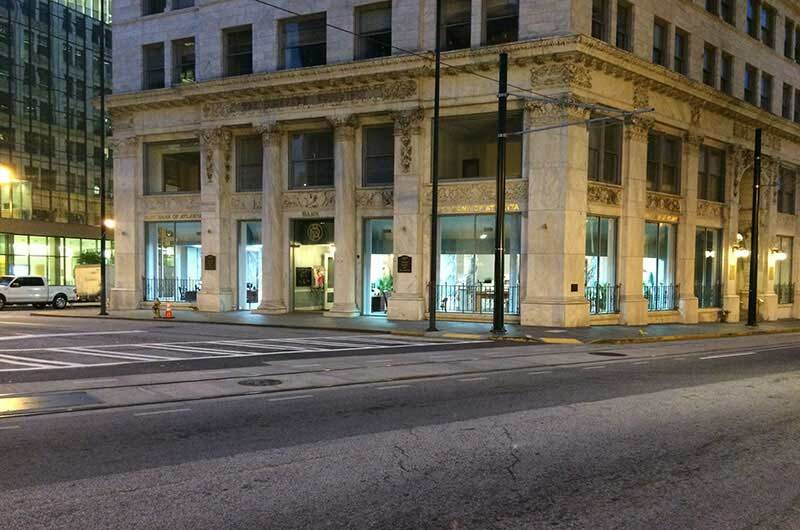 Eventually, a very detailed backstory emerged from Edgar’s people about the history of the garment industry in Atlanta and how Doc was working in high-end menswear originally, and had then turned to a life of crime once the industry shifted to overseas manufacturing. We filmed at Central Atlanta Props and Sets (CAPS), an awesome local prop house, and the business was nice enough to empty out 3 very full rooms for us to dress prior to our prep there. 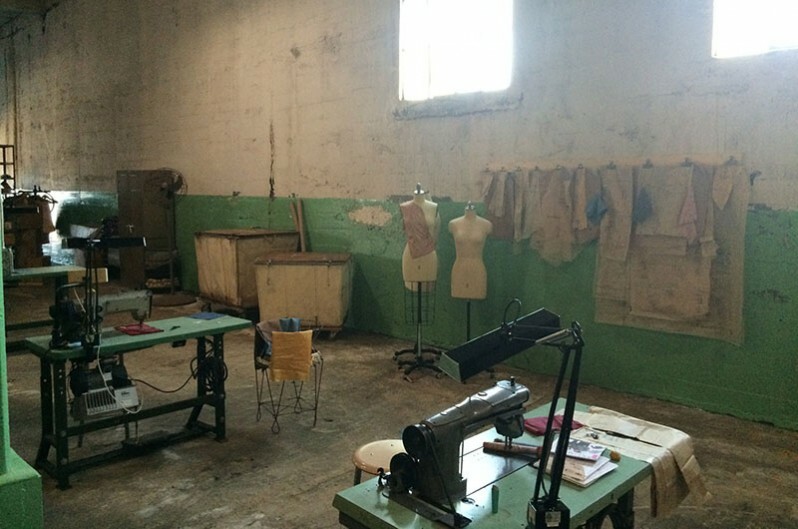 It also was pretty great working in a prop house, since they were able to help me with many items of dressing we needed anyway and were able to just add them to our rental right there on the spot. We did most of the constructed elevator scenes there too, and we dressed an additional room that didn’t get used much at all in the final cut. The Abandoned Rail Yard was a practical location at the Pullman Yard that gets used for filming an awful lot in Atlanta. It wasn’t as dressing-intensive as most of the other sets, though we did bring in some great shipping containers and a lot of crates and other industrial freight items that helped with the shoot-out scenes. We provided all of the rifles and ammo crates as well. 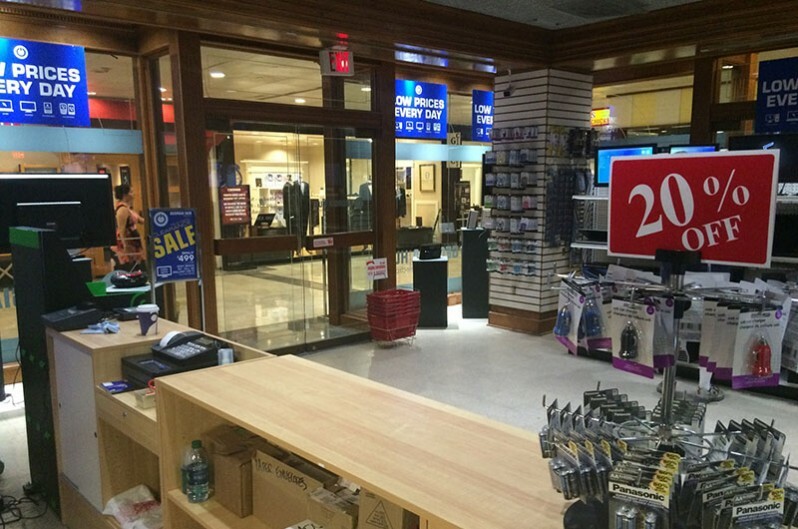 The exterior of the Post Office was a large building on the campus of GA State University downtown, so the interior location that was chosen also had to be quite large. 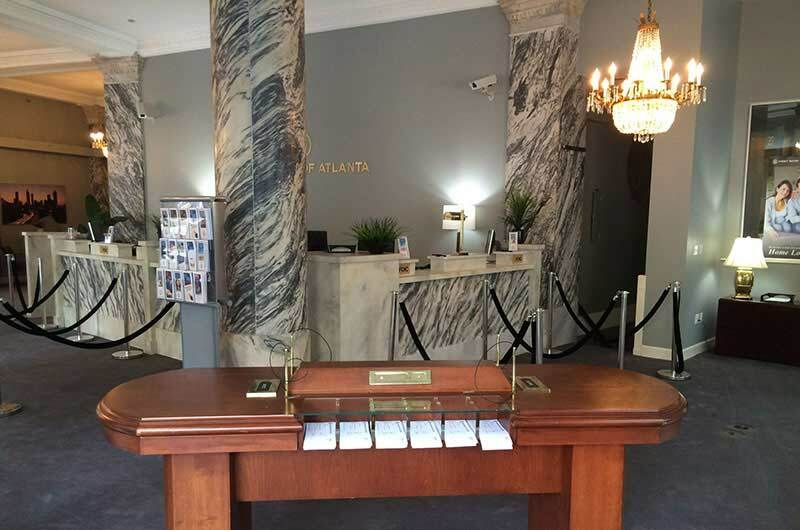 Eventually it was decided to create the interior in a closed-down bank in Gainesville, GA, about an hour outside of town. It was shot in half a day and was married to the location where Baby brings Joe for safekeeping when he decides to go on the lam. 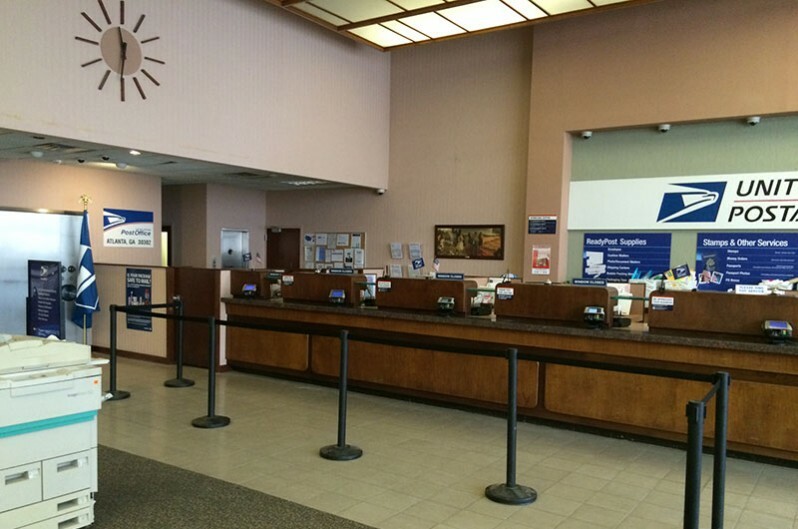 The Post Office was initially a tough concept for me to grasp, as Edgar was clearly thinking of the great post offices of Europe that are quite grand and, in fact, operate more like banks do here, with currency exchange and the like. The physical space for the interior Post Office set was big and completely empty, but the room itself had amazing mid-century architectural detail, so that helped a lot. 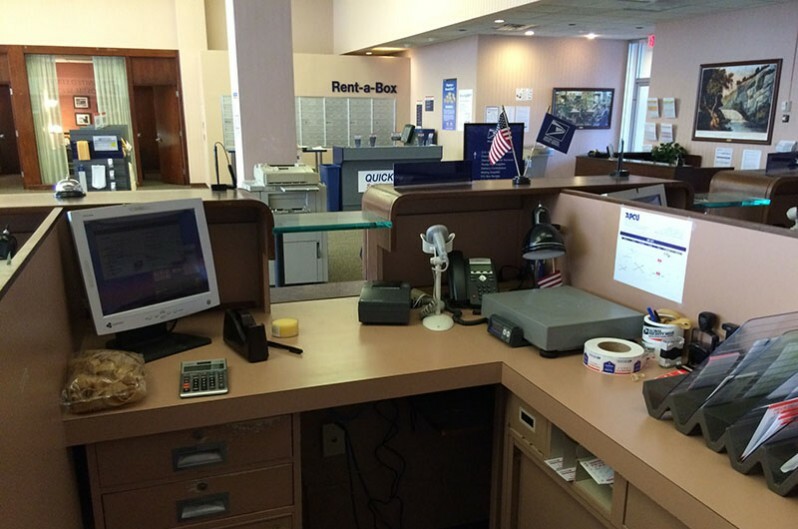 It was just unmistakably an American bank, due to the style of counters and even a big safe right in the middle of one wall! It presented a big challenge for decorating, but my office staff, especially SD Coordinator Lauren Adams Jones and SDPA Ashley Travis, and Buyers Vanessa Rogers and Monica Van Schellenbeck, all of whom were invaluable throughout the project, were very creative in helping me figure out ways to copy real-life post offices that have the modern POS displays of shipping supplies. 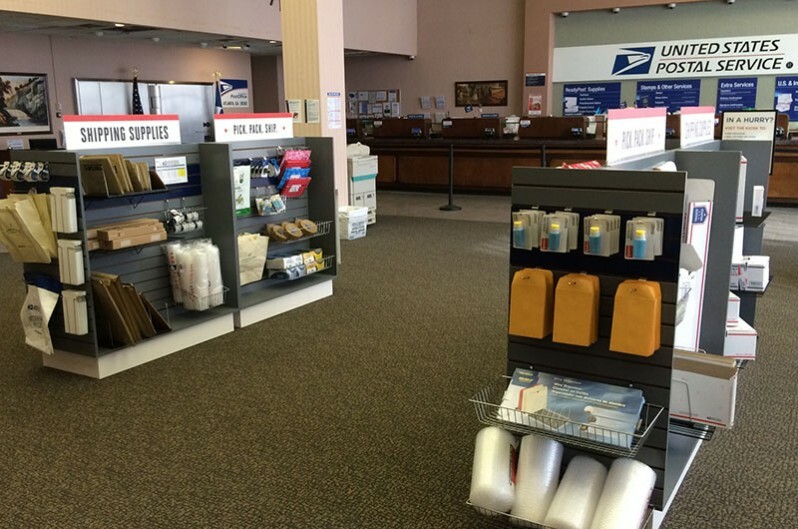 Clearance/Legal said we were OK to use USPS products and logos, which helped a lot. So we just kind of dug in with the massive task of gathering all the supplies and items we could get our hands on. 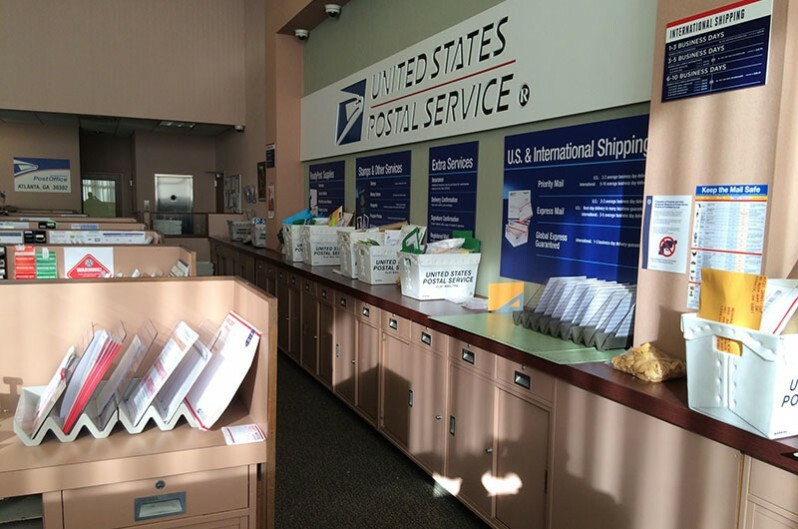 It took weeks of ordering supplies and shopping for postal scales and registers and mail sorters and all the stickers and labels and stuff you see around the counter/register areas. Graphic Designer Lisa Yeiser was also invaluable—we gave her a very detailed breakdown of all the types of signs and lettering we’d seen in our research and how many we needed and in what sizes, and she banged it all out for us. 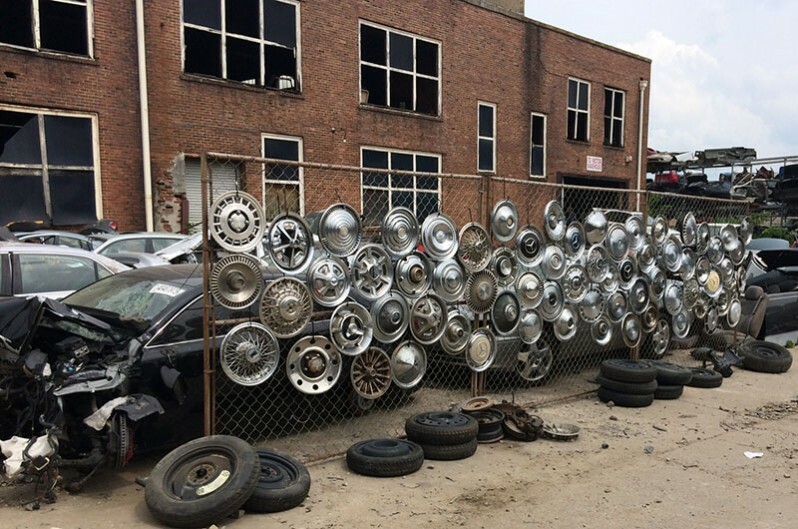 For an action/heist/car chase movie, there was still a lot of set decoration work to do! We also created a complete electronics store in an empty shop in a mall just for Baby to run through when he’s being chased by the cops. We also did major augmentation to an existing clothing/sundry shop in the same mall for part of that dizzying sequence. 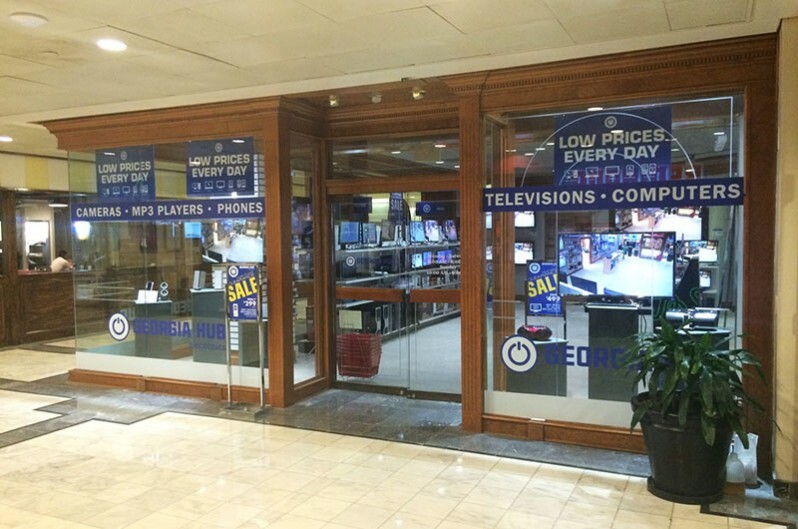 I knew at the time that a few of these environments would just be a blip on the screen, but you still have to put in all the correct elements and do all the dressing work, from store fixtures to lighting and packages and signs. 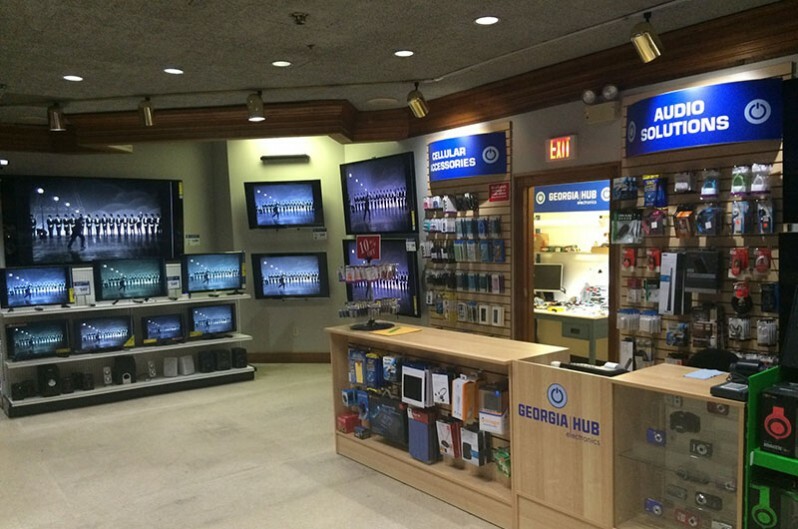 Graphics was again a huge help in making a store like that work, not to mention the video playback guys who synced all of those TV monitors as Baby runs through. Another challenge for dressing BD in general was all of the Second Unit roadwork, which still involved sets, as the chases usually began or ended at a dressed location. So there was a lot of coordinating of when to prep things and when decorative items had to go back for 2nd Unit pick-ups, or in many cases for the multiple re-shoots that BOTH units required in order to get all the footage needed. A couple of times, 2nd Unit would shoot a particular part of a sequence before 1st Unit had, which meant we often established things in advance and then had to re-create them multiple times over again. This was true of all the various parking garage sets, which involved actual scenes with dialogue as well as many stunts and action sequences that were shot at other times. The schedule was tough to keep up with. I foolishly rented certain elements of dressing with the understanding that we would be shooting a sequence as scheduled for a certain period of time, then found out later that an element of the stunt needed to be shot again or adjusted in some way. The alleyway where Baby does the 180-degree slide between the dumpsters and the carpet moving van in the opening chase sequence, had to be set up 4 or 5 different times, and always shot on Sundays as the alley was on government property. In fact, most of the road work was done on weekends so we could close down major streets and highways. 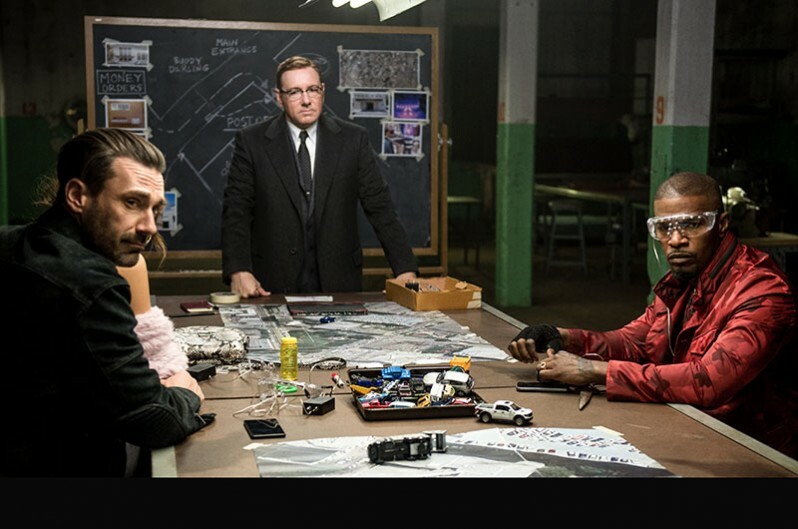 The exterior Post Office sequence, where things start to go wrong after the heist, was probably set up at least 3 different times as well, which we definitely did not know to plan for. So essentially, we had to set up a construction site and scaffolding and all of the Post Office elements and the big flatbed truck of rebar, all on a busy downtown side street each and every time. It made keeping up with our rentals very tricky, not to mention matching continuity! Thankfully, Leadman Shun Jester somewhat miraculously handled the scheduling and logistics! 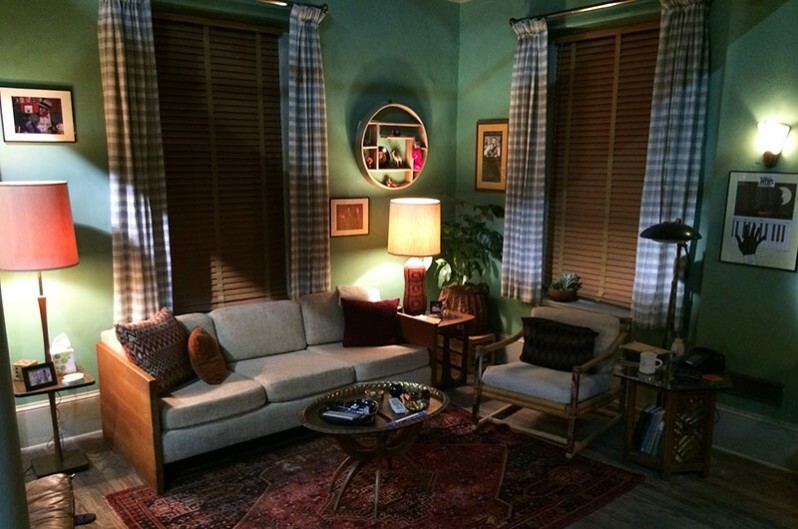 Joe’s Apartment where Baby lives was a favorite of mine and certainly the most character-driven set. There are a couple of terrific choreographed musical sequences that take place in the apartment, as well as the tenderest moments between Baby and his foster parent Joe. The idea was that Joe is an older Atlanta musician, now deaf, who raised Baby once he was orphaned. 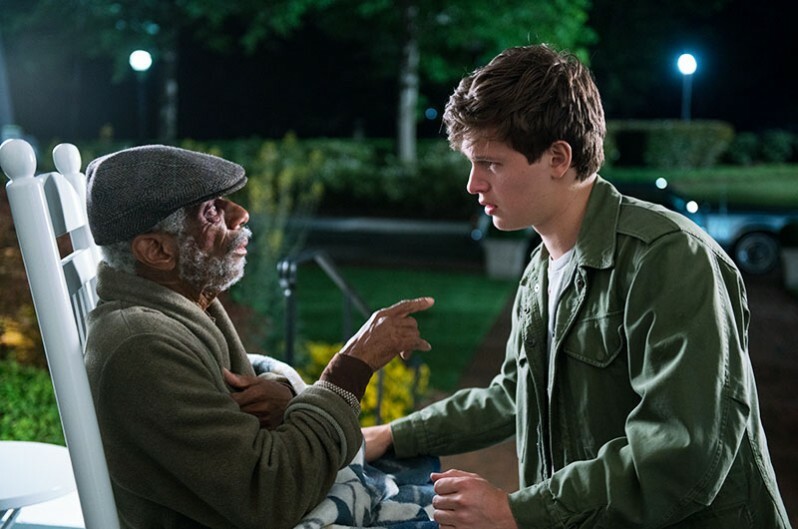 I believed that Joe worked in the recording studio where Baby’s mother recorded “Easy” in the flashback scenes, and took in this little kid who suffers from tinnitus, teaching him about jazz and blues music and also how to manipulate older audio equipment and mixers and the like. So the apartment was intended to reflect the life and history of an older black man who came of age in the 1960s and probably achieved some level of success in the mid-‘70s. We assumed there was a Mrs. Joe at some point, and that their combined interest in art and music drove the general décor of the home some 30-40 years ago, and that it was largely unchanged until Baby came of age and started to add his layer of personal items like clothing, sunglasses, and iPods on top. 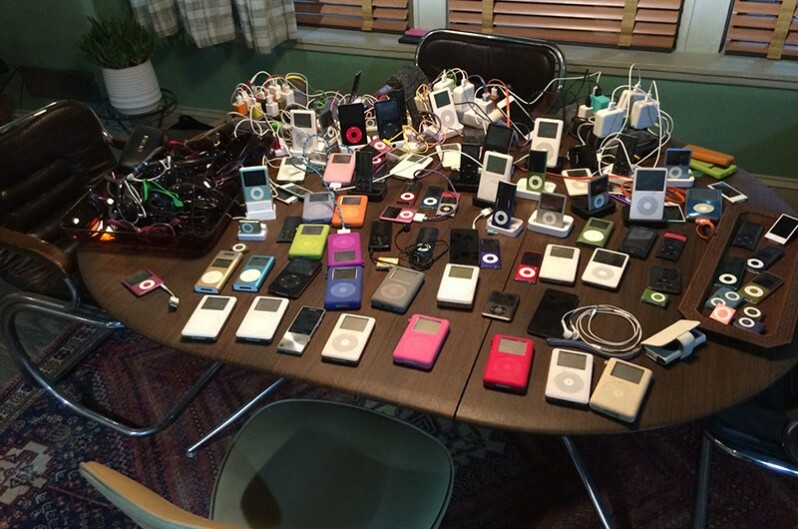 So many iPods! We bought over 200 of them on-line during prep and that was a big deal in and of itself, let me tell you. We also tried to put a lot of very specific Atlanta references in the Joe’s Apartment set, from the original artwork we used and the photos of local musicians, to bumper stickers and fridge magnets from favorite local dives and restaurants...calendars, coffee mugs and the like. We do so much work here in GA that stands in for somewhere else, it was a blast to be affiliated with a project that celebrated our town as much as it did. 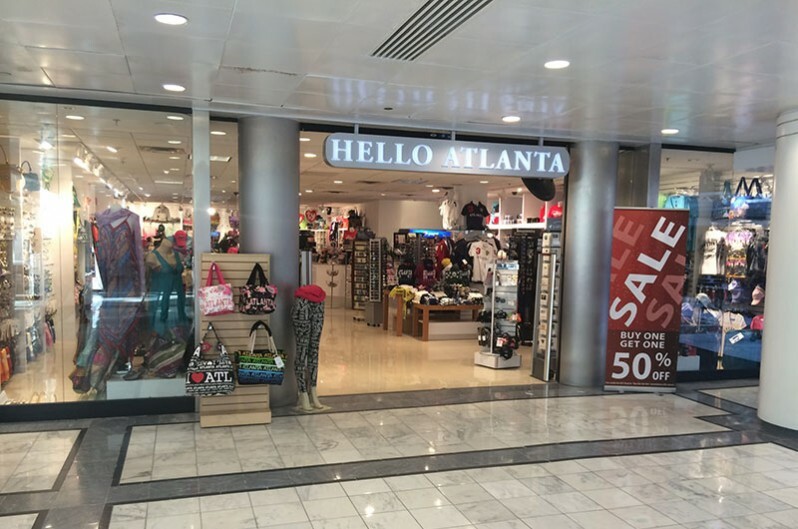 Though the movie wasn’t originally written for Atlanta, once Edgar got here and started to explore the area, he very much tailored the story to the city, casting local figures in cameo roles and changing dialogue to be specific to Atlanta. I think one of the highlights of the project for me was the movie’s enormous musical component. I’m a very big popular music fan in my regular “non-professional” life...a collector of physical musical media, a concert goer, a student of rock history and an avid reader of music bios, etc. Music is really my primary lifelong hobby. So I feel that, rather coincidentally, I was the perfect choice to decorate this movie, being that it is essentially a pop musical wrapped in a bank robbery/car chase movie. It was not a factor in my being hired, but I think the fit worked out very well for all involved. I’m not going to say that I’m the best set decorator in Atlanta, but I do think I’m the best Set Decorator in Atlanta for a movie dealing with record collecting and analog musical equipment and recording gadgetry! Once we decorated Baby’s home recording studio, it certainly didn’t hurt that Shun and several members of our crew were also record collectors and former professional musicians and audio geeks. We had a lot of fun gathering and putting together all of those specific elements for Baby’s audio pastiches, many of them requested by Kid Koala, who coached Ansel Elgort, who plays Baby, on how to use the analog gear on-camera. 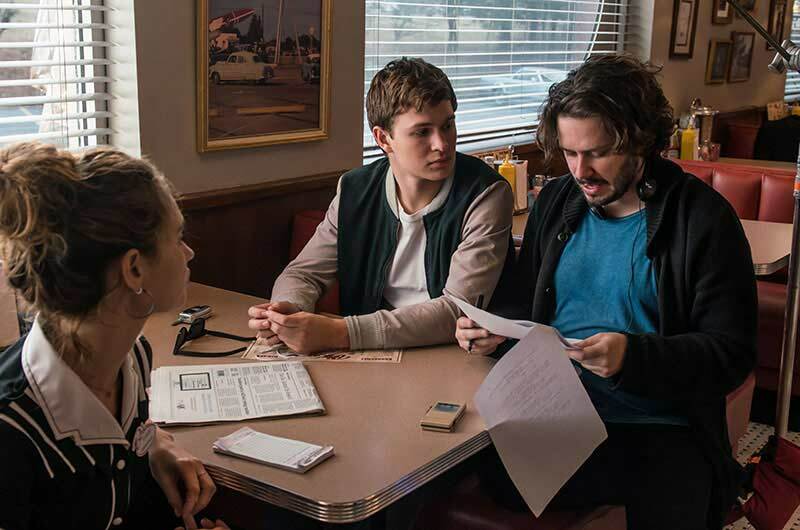 Edgar Wright’s script called out all of the film’s music cues very specifically from the get-go, too. It wasn’t like most shows where they write with a song in mind and then often have to settle for something else later based on clearance fees or whatever. All of the action sequences and choreographed scenes were set to and named after very particular songs, and Edgar was adamant that we have all of the physical records that originally contained these songs on hand at all times during the shoot. It became clear to me from the start that he intended to be able to show all of the songs for the films soundtrack within the sets themselves. So I systematically gathered all of the records on his master list of “must-haves” very early in the prep period. 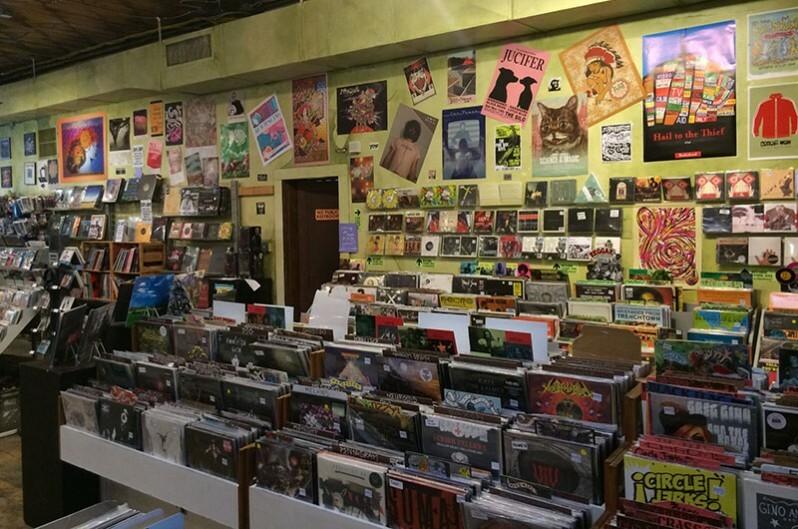 And I say this as a fellow music geek, Edgar’s tastes are very eclectic and he came up with a few artists/songs that were completely alien even to me, and there were a few others that proved quite difficult to find vinyl copies of. All of the music that plays in the Diner, for instance, had to be available in 45 rpm single format to shoot close-ups of the various songs dropping and playing on the jukebox as needed. Likewise, we had fun placing various album covers around Joe’s Apartment set. Not all of this made it into the final cut of course, but there are lots of little bits and pieces of this stuff throughout, if you know where to look. Another noteworthy aspect of the film’s look is Edgar Wright’s love of visual puns and the symbolic use of names. He definitely wanted to incorporate real brand names and advertising that spoke to the themes of the narrative. 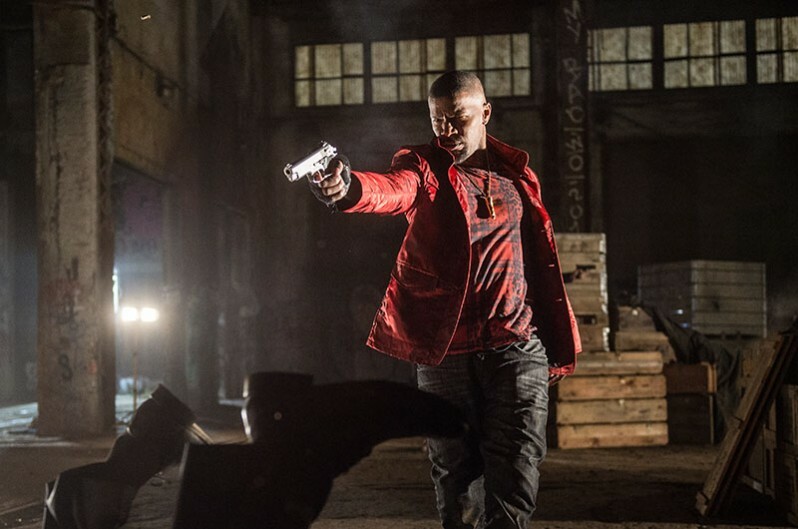 So during chase scenes, he absolutely wanted to see ads that spoke to a sense of speed or flight or theft or being chased. Whether you approach this from the standpoint of clearance or product placement, it definitely creates a sensitive scenario from the point of a view of a studio’s legal counsel. Nonetheless, we created these master lists of real-life brands with the Art Department staff and started submitting them to Sony’s Brand Integration department first, and then eventually to Clearance as the big national companies pretty much all declined to do product placement in an R-rated action movie about car theft and bank robbery. Long story short, we found ways to have signs and banners made that faithfully reproduced the logos of Sprint, and Target, and Boost, and a few others to place in the background during chase scenes. The selection of the pizza delivery company that Baby works for when he tries to “go straight” was another example of this. Edgar originally wrote it with Little Caesar’s in mind (as a reference to the classic American gangster film), but once they passed (as did Godfather’s Pizza), we finally settled on local Atlanta chain Goodfella’s Pizza, because we wanted to shoot in a practical location that had an iconic name and really did offer delivery service. 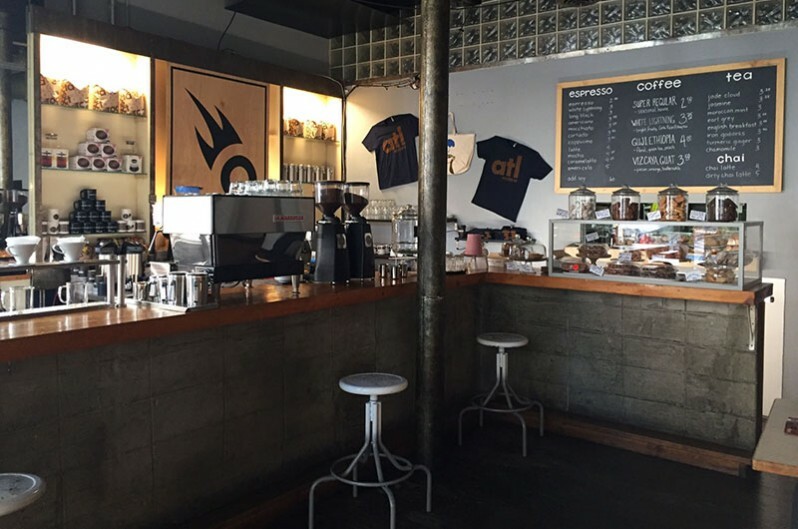 Conversely, Edgar (a major coffee enthusiast) fell in love with local Atlanta caffeine purveyors Octane, not only because of their excellent products but largely because of their name. However, there was not an Octane near the location with the long Steadicam shot at the beginning of the movie when Baby dances down the street on his daily coffee-run. So we had to create a perfect replica of an Octane coffeehouse inside an existing bar/restaurant at the end of a very real downtown street that we dressed like a back-lot. That was all done for Day 1, too! 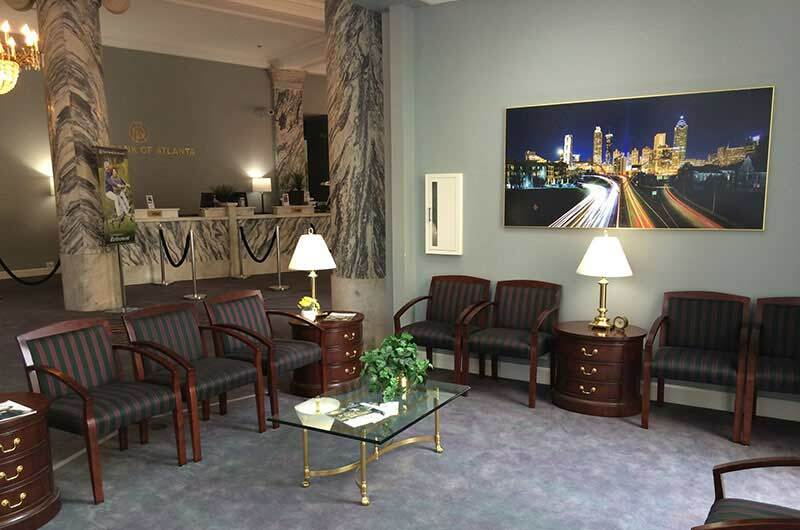 I worked very closely with the owners of Octane, who were most helpful in loaning us some specific items to make our location convincing as part of their brand integration deal.